Over the next three decades, global food demand levels will rise by close to 70% – thanks to the exponentially growing population. A recent survey found that >800 million people worldwide do not have access to sustainable levels of food/other agricultural resources. The importance of the primary sector is further underlined by the fact that 4 out of every 10 people in the global workforce are employed over here (even though farming is not a particularly favourite field of activity for millennials). With the total volume of arable land steadily diminishing due to a series of factors (climatic changes, urbanization, large-scale industrialization, etc.) – the focus has shifted towards maximizing the yield from the available land resources. This is precisely where the concepts of ‘smart farming‘ and ‘precision agriculture‘ come into the picture. While the terms ‘agriculture’ and ‘digitization’ did not quite go hand in hand traditionally, the times are changing. In France, more than 65% of full-time crop-growers have expressed their interest in investing their resources on precision farming tools and technologies. The scenario is roughly similar across the globe, with the emphasis squarely on boosting yields, increasing margin earnings, and doing away with the uncertainty factors (e.g., those associated with fertilizers and/or irrigation). With the demand for automated farm management software and gateways increasing, large companies have started to offer real-time farm-based data, like soil conditions, crop cycles & performance, and moisture levels, as a ‘service’ to the farmers. These, together with higher-quality equipments and dynamic pricing, are bolstering yield quality and farm revenues. Note: The challenge lies in making the technologies uniformly available to all farmers. Providing the latter with the necessary training is also vital. There is, without a shadow of a doubt, a direct correlation between the size of the farm, and the ability of its owner to spend big bucks on smart farming tools. However, considering that smart agritech solutions are meant for only the biggest of farms would be too naive. Nearly 76% of the total food in the world is produced in small, family-based farms (as per a UN FAO report) – and this makes the implementation of high-end precision tools in such farms absolutely critical. Such farms are, on average, <2.5 acres in size, and often suffer from various constraints – with fund crunches being the most common. Over the next few years, we can reasonably expect commercial farming practices to become prevalent in small farms too, aided by customized and powerful smart farming tools. 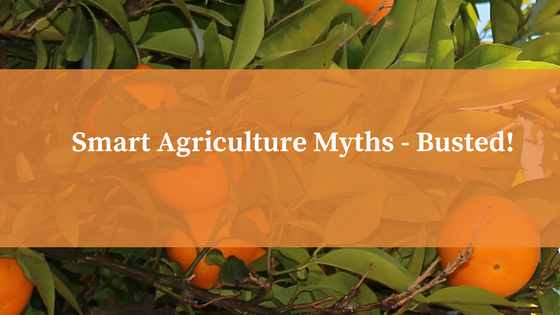 This is probably the biggest misconception related to smart farming out there. The origins of digital farming can be traced back to the mid-90s, when the first set of tractors with built-in GPS capabilities arrived on the scene. At present, the John Deere tractors have become relatively common in US farms (in particular), along with satellite imaging, agricultural drones and smart sensors. These are all pushing ‘digital farming’ to newer and greater heights. It has to be, however, kept in mind that ‘digital agriculture’ is a different – and a much more inclusive – concept. While ‘digital farming’ is mostly limited to field-centric data and operations, ‘digital agriculture’ includes everything, right from digital platforms for agriculture (like the one SAP is working on), food technology awareness generation, and tech-backed transportation & logistics, to supply chain optimization, food safety, and better engagements of farmers with other stakeholders. The progresses made thus far in ‘digital farming’ make up only a small section of an integrated farm management system – which is what ‘digital agriculture’ is all about. Note: Innovative and high-utility digital solutions for agriculture have been released by several leading players, like IBM, Bayer and Monsanto. The worldwide big data market, currently valued at ~$41 billion, is expected to be worth $88.5 billion in 2025 (~115% increase). Buoyed by the performance and efficiency boosts brought about by systematic application of big data in other fields and use cases, it is increasingly being used for creating databases for digital farming tools too. The practice, unfortunately, comes with its own share of risks and uncertainties. For starters, unlike factory-based or workplace operations, agricultural activities and outputs are affected by natural factors (even though technology is being used to minimize their effects) – and there is no way of accurately predicting certain things. In other words, the crop-growing industry is a highly segmented one – and over here, big data is useful, but not always all-encompassing. What’s more, the analytics reports also fail to bring out the right picture at times (for instance, it is impossible to ascertain the percentage of yield increases caused by favourable climate conditions, and the percentage due to application of agritech solutions). With the right insights and greater accuracy of data, these uncertainties can be done away with in future – but there is still a long way to go. Not quite true, While increasing the grid resolution should, theoretically, offer more accurate data outputs – problems would still remain over the maintenance and delivery of the higher number of grid points. In addition, it has been seen that agricultural weather grids generally fall short of 100% accuracy – and hence, simply increasing the resolution levels do not always provide the benefits originally expected. Instead, farmers and smart farming service providers need to maintain a proper balance – by ensuring that the collected data will indeed be relevant for their day-to-day operations (concentrating only on grid resolution can be counterproductive). The resolution for numerical weather prediction, or NWP, needs to be optimized, and end-to-end analytics platforms (with custom agronomic modeling) have to be created. These would deliver greater value to contemporary agricultural practices. Agriculture is not a so-called ‘hard science’ – and it would be a gross mistake to expect it to behave as one. It is one thing to ‘know’ what crops SHOULD be grown at what time (with the help of the agritech tools and assistants), but such data need not necessarily match the food patterns – or even the preferences – of human beings. For instance, the conditions in a farm in the Netherlands might not be in favour of dairy farming – but there is a high chance that such ‘logical conclusions’ will not be heeded. The rising awareness and concern over environmental hazards, welfare of animals and personal health risks also have important roles to play in modifying the behaviour of customers – forcing them to think beyond the price tags and supply-side elements. A clear example of this would be the steadily falling consumption of red meat across Western Europe. Digitized agriculture promises plenty of advantages, and large-scale overhauls in farm activities are required – but long-standing food habits are not going to change anytime soon. This is not a field that is driven by logical expectations only. Smart agriculture is all about innovations. Not surprisingly, new players are making big splashes in this domain – from investors and incubators, to tech service providers and partner companies. On the other hand, the established, large-scale companies are feeling the heat – since most of them fall short on that much-needed ‘innovation’ factor. This, however, does not mean that precision farming will be dominated by only startups in the foreseeable future. While coming up with revolutionary agritech ideas is easy for them, they often run into problems during the idea validation stage – primarily because they do not have the specialized manpower resources to test/implement their proofs-of-concept (PoCs). As a result, agritech startups are collaborating with big organizations, to access the better facilities, real validation, and improved marketing options. Hybrid models are becoming more and more common – and in future, it will be the business partnerships (and not the startups alone) that will make a difference. Note: Contrary to what is widely believed, large scale agricultural farms are not necessarily more efficient. In fact, a recent study revealed that output from smaller farms can be nearly two times more than their larger counterparts (much higher yield-per-hectare). Once upon a time, agriculture used to be more about physical strength than mental acumen – but those times have now been relegated to the pages of history. On average, a crop-grower using smart farming tools and data have to handle as many as 4 million data points annually (this is based on a Farmer’s Business Network report). On top of that, farmers need to be capable of operating the self-driving tractors, the smart field sensors, the drones and a host of other cutting-edge technical tools and accessories. For maximizing field outputs at the time of harvest, a wide range of advanced machines and gateways have to be used by farmers – and unless they have proper education and the required training, the task would be beyond them. Managing a ‘smart farm’ is not the easiest task in the world – and ‘smart farmers’ must be well-educated. At very high precision levels, maintaining high accuracy of virtual rain gauge data can be a big challenge. Many issues can crop up – from calibration errors and signal problems, to faulty radar setups and field clutter – affecting the accuracy of rainfall data/predictions. However, even if the rainfall data is mostly accurate, that does not necessarily mean that the overall weather data quality will also be optimal. It has to be kept in mind that wind/temperature forecasts are not related to rainfall forecasting (rainfall is not a parameter in Numerical Weather Prediction models either). Hence, it is not the standalone accuracy of rainfall data, but the overall relevance, personalization and actionable nature of the weather data that should be paid attention to. It might very well happen that the rainfall forecasts are fairly spot-on, but other key weather parameters might be wide of the mark. Note: IoT-based agritech tools, powered by LoRaWAN or Sigfox, can be used to generate high-accuracy weather data, mitigate water wastage (through over-irrigation), and bring down the uncertainties associated with agriculture. In an ideal world where everyone trusts everyone, a farmer should be more than willing to share their field data on the value chain – to exploit the latest digital agritech innovations. Thanks to the continuous malpractices against crop-growers since decades, this much-needed trust factor is missing (between farmers and large corporations). As a result, the farmers might not be very keen to share their confidential on-field data to corporate houses – in fear of manipulations and unauthorized usage. However, they cannot afford to keep working in isolation either – since that would mean they will ignore the potential smart agriculture optimizations. In any digital farming initiative, feelings of mistrust and suspicion are major bottlenecks. There are no quick fixes – and it would be great for everyone concerned if the trust-factor gradually builds over time. This one is far removed from the truth. We are in a highly digitized economy, one which technology has ceased to be a bottleneck long ago. Farmers (at least those who are willing to invest) can easily lay their hands on vertical agriculture tools, automated (GPS-powered) tractors, robotics, competitively-priced sensors, nanotechnologies, smart irrigation management systems, and a whole lot more. LPWAN technologies are gradually taking connectivity-related problems out of the equation, and food blockchains are also being implemented. Many manual (and hugely time-consuming) on-field tasks can be replaced with automated processes with the help of the available technology. Further adding to the convenience of farm-owners is the fact that the average prices of smart farming tools are on a downward trend. Apart from the already launched tools, many others are currently under development. Technology is not holding the primary sector back, that’s for sure. For generating location-based weather forecasts, the importance of optimally operated weather stations is immense. That does not, however, mean that farmers should always install such stations onsite. There have been many cases where the performances of weather stations have suffered due to instrumentation issues, or incorrect calibration, or simply wrong placement. In addition, the value of such stations for forecasting weather is limited (i.e., they contribute only a small section of an entire day’s weather forecast) in regular NWP models. What’s more – weather stations typically deliver information pertinent only to a small area, and cannot be referred to for large-scale analysis. Put in another way, these stations are not of much use on their own. The dynamic changes in climatic conditions cannot be captured by these either. The costs of maintaining full-blown weather stations on crop-fields are also not insignificant. Problems like excessive competition and overproduction made food production a ‘buyer’s market’ – where farmers had little say. With the advent of technology, this is gradually being converted into a ‘seller’s market’. For getting quantitatively and qualitatively enhanced outputs, customers have to cough up more money – with farmers standing to earn more. However, even the crop-growers who are ready to invest on precision agriculture have to be made familiar with, and thoroughly convinced about, the value propositions associated with each new technology. Putting it in another way, the value of each new solution has to be ‘proved’ continuously, to motivate the farmers to spend money for it. With most farmers having shortage of resources – their ‘purchase decisions’ are, expectedly, taken after carefully weighing all the probable pros and cons of the different agritech tools and machinery. They have to be first made aware of the lingering issues with their fields/operations, and then acquainted with the tools that can resolve those issues. The $66 billion Bayer-Monsanto merger deal has generated quite a bit of buzz among agritech and foodtech enthusiasts worldwide. There are several large corporations with global presence in the food industry. However, it cannot be inferred from these information that multinational companies rule the roost, as far as the food industry is concerned. The true picture is, in fact, quite the opposite – with 8 out of every 10 food producers in Asia and sub-Saharan Africa being small landholders. Extreme fragmentation has traditionally characterized the worldwide food industry, and continues to do so. Food security and land ownership are key causes for this fragmentation – and barring a few sub-segments (grain production, for example), both small local land-owners coexist with billion-dollar stakeholders. Every player has to ‘optimize’ its operations to generate value. Unlike, say, the telecom industry, agriculture will not be ‘ruled’ by a couple of MNCs. By the end of 2024, ~225 million smart agritech devices will be in active use (in 2014, the corresponding figure was a measly 12 million). The CAGR of the agricultural IoT market is expected to hover around the 20% mark over the next few years. Precision farming tools and techniques are set to pick up further momentum – and it’s high time we knew the truths behind the many myths shrouding this domain.